Curry College is proud to announce that Justyce Otero of Chichester has been named to the Dean’s List for the Fall 2018 semester. To qualify for the Dean’s List, students must earn a 3.30 GPA, have no incompletes, and have no grade lower than a “C” for the semester. Congratulations to Brendan Murray of Chichester, a student at the University of Rhode Island, on being named to the Dean’s List. Chichester Grange meets only once in the month of January. The next meeting will be February 6. Find us on Rte 28, north end, near the Pittsfield line. Mon. 8-12; Tues. & Thurs. 8-4; Wed. 11-4 & Sat. 10-4. 247-7191. Welcome to Tom Downey as an Alternate to the Board of Trustees. The Board of Selectmen recently approved his appointment and he is already proving to be invaluable to the Board. The Knitting Group continues to meet on Wednesday afternoons, at 3:30 p.m. Don’t know how to knit, but would like to learn? Come and be with some of our best knitters. Pre-school Story and Crafts group will be meeting on Thursday morning, January 17th at 10:45 a.m. Patrons are always welcome to come and avail themselves of the various activities in the library, but Tuesday mornings at 10:30 have been set aside for coloring, coffee (or other beverage) and conversation. Toddler Time is also on Tuesday mornings at 10:30. Martin Luther King Jr./Civil Rights Day is being observed on Monday, January 21st. The library will be closed. Thanks to all who participated in clothing for the homeless and Socks for Seniors. The latter are being donated to the Epsom Nursing Home. There will be a special meeting of the Lovers of the Chichester Library on Wednesday, January 16th at 7 p.m. relative to finalizing plans for the “Mid-Winter Warmup,” i.e., an evening of soup and fellowship at the library on Saturday, February 2nd. Did you know that Chichester Library users saved $89,747.13 over the past year? That’s quite a savings! Do you want to know what’s new, or what’s particularly popular at the library? Go to http://www.chichesternh.org/Public_Documents/ChichesterNH_Library/townlibrary, and look at the bottom of the page for the additional links. The new books show a wonderful selection of new reading material. There’s no reason for boredom when you come to the library! Due to a scheduling conflict it has become necessary to reschedule & relocate the Public Hearings for the proposed Zoning Ordinances. The first Public hearing will be held on January 21, 2019 at the Grange Hall at 6:30pm and the second Pubic Hearing will be held on February 4, 2019 at the Grange Hall at 6:30pm. There will be another informational meeting on January 17, 2019 at the Chichester Fire Department at 6:30pm. On Wednesday, January 16, there will be an opportunity for CCS parents and all Chichester citizens to learn about the proposed school district budget for the 2019-2020 school year. This Budget Hearing is held at school beginning at 6 PM. The budget encompasses educating all Chichester students whether at CCS, Pembroke Academy, or alternative locations. It is important for families to understand the school budget as this provides the funding for the education of all Chichester students. The date of the School District mtg. and voting on the proposed 2019-¬20 budget is Saturday March 9, 2019 at 9 AM. All families should mark their calendars for these dates. Barbara Jones Frangione, 94, passed away peacefully on January 4, at her home in Chichester NH, surrounded by her family She was born on December, 6, 1924 in Newark, New Jersey to John and Martha (Palmer) Jones. Barbara grew up in Huntington, New York. She graduated from in Huntington High School in 1936. After high school she worked on the family dairy farm in Huntington, NY and moved to work at the Mohawk Textile Mill, in Amsterdam, NY. She also travelled cross country to California with a friend and worked there for a time. Barbara married Donald A. Frangione on February 17th, 1952 in Huntington, NY. They were married for 37 years until his death in 1989. Besides her husband Donald, Barbara was preceded in death by her sister Joyce Jones, parents John and Martha Jones, and her daughter Joyce Liebl. In 1963, she and Donald moved the family from Huntington, NY to Chichester, NH where they bought the Langmaid Farm. Besides being a homemaker, she also worked as a waitress at numerous restaurants and assisted her husband, Donald, run a catering business. At the age of 49 Barbara graduated from the University of New Hampshire in 1973 and received a BA degree in Home Economics. She worked for 18 years as a Home Economics teacher at Pembroke Academy High School until her retirement in 1993. Barbara was an active member of the Chichester United Methodist Church, Daughters of the American Revolution (DAR), Chichester Historical Society, Chichester Grange, and the Suncook Valley Pomona Grange. Barbara had many diverse talents and passions. She was a 4-H leader and was very proud of her flower gardens. She was very interested in genealogy and, by the time of her death, had traced the family tree back multiple generations. 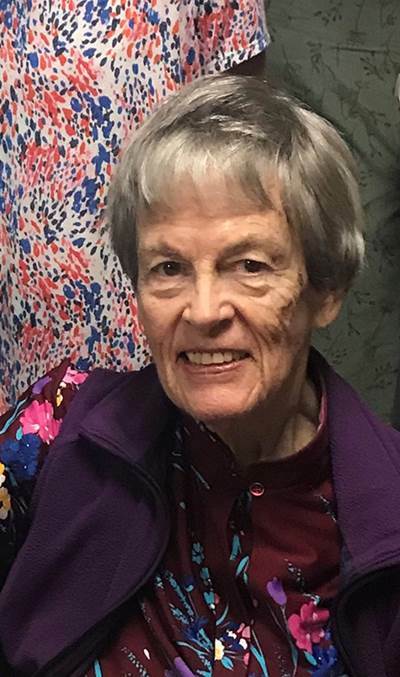 She sang in numerous choruses, most recently The Suncook Valley Chorale, was a Master Gardener, an accomplished (and published) seamstress, spinner/weaver, rug braider, and soap maker. Barbara was Chichester’s Citizen of the Year in 1998. She served for 20+ years as a Chichester Supervisor of the Checklist. Barbara is survived by her daughter Donna Scribner and her husband Kenneth Scribner, Jr. of Center Barnstead; son Paul Frangione and his wife Eileen Frangione of Richfield Springs, NY; son Thomas Frangione and his wife Kathy Conway-Frangione of Barnstead, NH; son-in-law Mark Liebl of Sanbornton, NH; her sister Dorcus Zarse and husband Bob Zarse of Florida; sister Betty Versnik of CT; brother John Jones of Florida. Grandchildren: Kevin Scriber and his wife Hedda Scribnerof Topsham, ME; Melinda Scribner and her partner Al Braga of Decatur, GA; Dr. Andrea Liebl and her husband Dr. Christopher Anderson of Vermillian, SD; Chris Liebl and partner Maggie DiMiceli of Anchorage, AK; Elizabeth Duclos and her husband Jeremy Duclos of Penacook, NH; Laura Mayo and her husband Will Mayo of Lee, NH; Kristin Ruggierio and her husband of Matthew Ruggierrio of Englebrook, NJ; Maria Frangione of Portsmouth, NH; Anthony Frangione and fiancé, Emily Cook of Bellbrook, OH. Greatgrandchildren: Laine and Trenton Braga of Decatur, GA; Garrett Scribner of Topsham, ME; Conner Duclos of Penacook, NH; and Isla and Malcom Mayo of Lee, NH. There will be no calling hours. A memorial service will be held at Chichester United Methodist Church, 45 Main Street, Chichester, NH (http://www.umc.org/find-a-church/church/11194), 10:30 AM on January 19th, with a reception following at the Methodist Parish Hall. Burial will follow in the spring at the Pine Grounds Cemetery in Chichester. In lieu of flowers the family requests memorial donations be made to the Leukemia and Lymphoma Society (lls.org) or the NH 4-H Foundation (https://extension.unh.edu/programs/4-h-foundation-new-hampshire).